MTTM programme is designed to develop and nurture change agents in the domain of aviation, tourism, wellness, hospitality, and heritage management. In view of the recent developments associated with tourism, which includes the upcoming international airport in Goa can convert it into a bustling aviation and logistic hub. With infrastructural developments and associated tourism based activities there is a requirement of skilled resources to cater to the demands created by the tourism industry. The course intends to provide expert training to tourism and aviation industry aspirants and to help them achieve professional level competences in their respective discipline. Post graduates of this programme will be able to acquire comprehensive knowledge in the area of tourism sector by developing their research capabilities, policy drafting and development, human resource management, marketing, MIS deployment, geographical comprehension, entrepreneurship, quality management skills which will prepare them to pursue enriching careers with travel process outsourcing companies, global distribution system companies, aviation and airline industry, logistics and cargo management firms, travel houses, museums, and destination management companies with an array of career opportunities starting from mid management level. To seek admission to MTTM programme, a candidate must have passed a degree in any discipline with at least 40% marks. The admission is granted on the basis of equal weightage of marks obtained at the entrance exam as per Goa University regulations and the qualifying degree exam in order of merit. The post graduate degree of MTTM will be awarded to candidates earning 64 Credits during the two years. 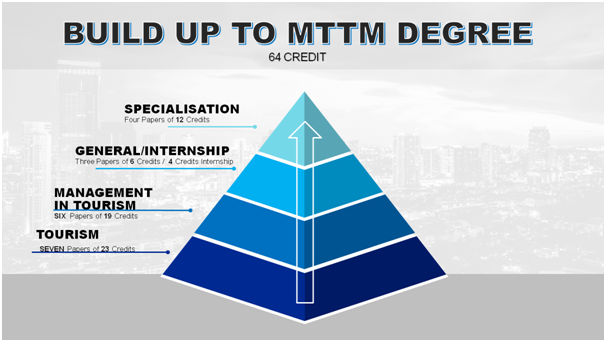 Of these 52 credits are for the compulsory courses which includes an Internship of 6 credits and Dissertation of 8 Credits, While 12 Credits for the optional subjects that lead to MTTM specialization. Each credit will carry 12 hours of training. A paper of 4 credits shall be a total of 100 marks with duration of 3 hours at Semester End Assessment (SEA) examination for 60 marks, while Inter Semester Assessment (ISA) will carry 40 marks. A paper of 3 credits shall be a total of 75 marks with duration of 2 hours at SEA examination for 45 marks, while ISA will carry 30 marks. A subject that carries 2 credits shall be a total of 50 marks with duration of 2 hours at SEA for 30 marks, while ISA will carry 20 marks. The MTTM programme is divided into four semesters. Each semester will have compulsory papers, Students are given an option to choose a specialization track from a list of five as prescribed on the list of courses from the third and fourth semester. Every student has to undergo 4 weeks of internship in functional area of the specified tourism and aviation industries. The students are required to maintain an internship log and document relevant data for scrutiny during the internship presentation along with a formal report. The internship carries 4 credits and carries a score of 100 marks. * Compulsory Indicated as MTT-C, Optional Indicated as MTT-O , Students to take up compulsory summer internship after II Semester.